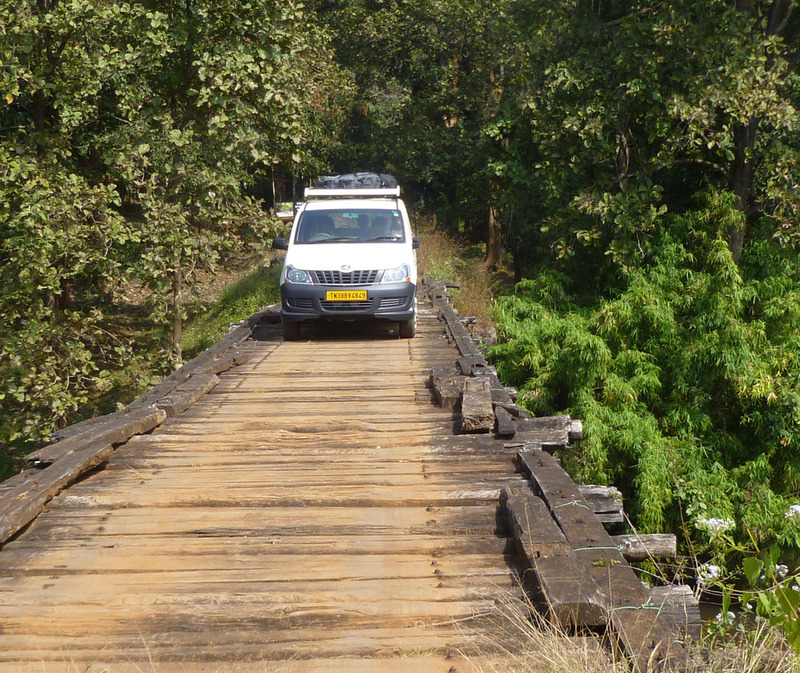 Topslip is the part of Anamalai that is adjacent to the Parambikulam Tiger Reserve. 26 December 2013. Summary: Spent morning negotiating the accommodations with officers at both Topslip and Parambikulam. Collected at two sites deep within the core area of Perambikulam in an area of no public access, with Selvan our accompanying forest official for the day. Today’s sites would be 1) a tributary of the Kuriarkurthi River way below the dam at Turnakadavar Reservoir, and 2) a slow stretch of the Kuriarkurthi itself in the same general area. 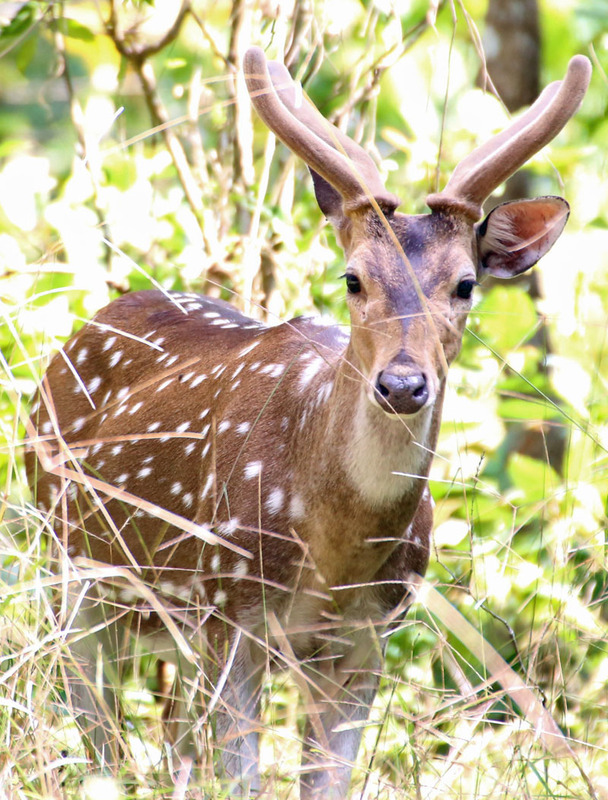 The Anamalai Tiger Reserve and Parambikulam Tiger Reserve together comprise a fairly large tract of protected area south of Coimbatore and detached from the Nilgiri Biosphere Reserve, which includes the forests of Siruvani and Silent Valley. Anamalai is the part occurring within the south Indian state of Tamil Nadu and it includes the Topslip Forest, which is where we stayed at the guest house. Parambikulam is the part within the state of Kerala. Each reserve has its own administration, paid for by the state in which it occurs. Research and collecting permits are issued by the state government, and while Dr. Mani has permission to collect in Kerala, his permit is not valid in Tamil Nadu. However, Dr. Mani is a big fish to the Topslip management because of his history there. He has spent a lot of time collecting at Topslip in the past, and he provided all of the fish specimens at the little natural history museum they keep at the visitor’s center. 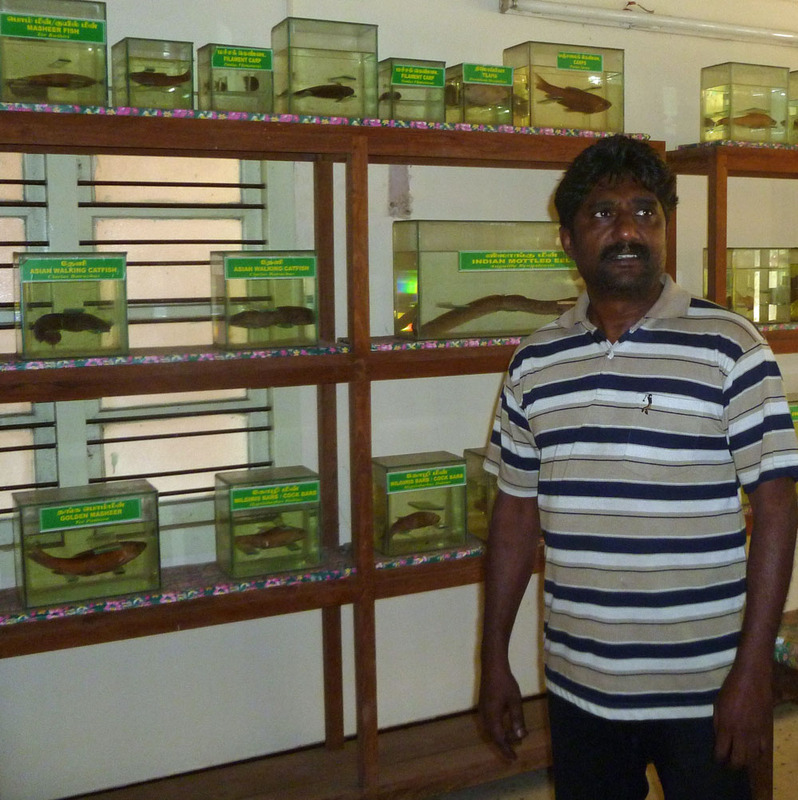 Preserved specimens of fishes collected by Dr. Mani and on display at the visitor’s center in the administration area of Topslip. I noticed a sign saying “Bridge out. Do not pass” and there were several broken planks. Dr. Mani spent much of the morning putting out metaphorical fires: phone calls to the high official who reluctantly bent the rules in allowing us to enter after hours, placating the on-site rangers whose bosses were called to make the exception to what is otherwise a strictly enforced policy. We also didn’t have a place to stay for the next night—the guest house at Topslip was going to be occupied by a different group. We went to meet with the Topslip Ranger in his office–I sat in that meeting, presumably as a bit of leverage, as in, “We must provide some nice accommodations for our international guest.” That meeting transpired entirely in Tamil. On our way in to Parambikulam we made a stop to visit the District Forest Officer (DFO—a higher rank than Ranger) to see if there were strings that could be pulled to get us some lodging there. Again I was brought in—only this time the meeting was conducted in English. 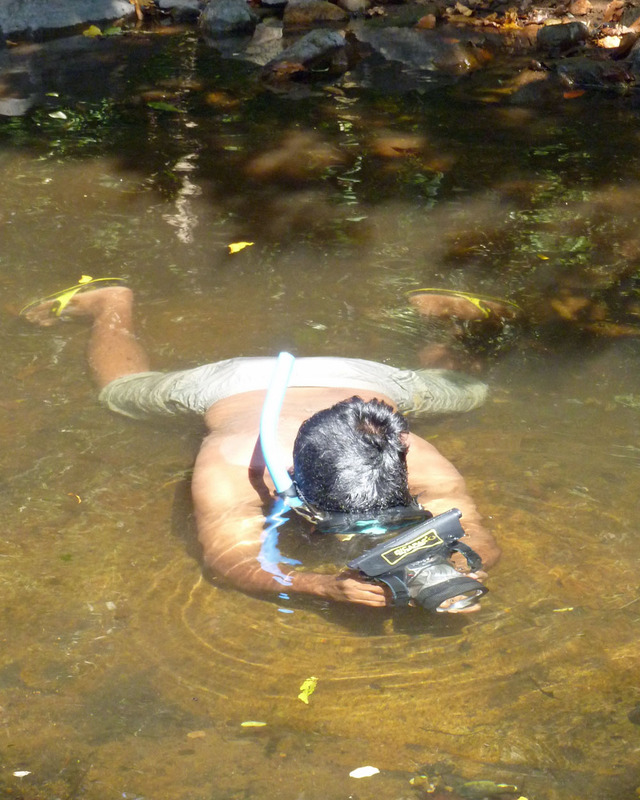 Dr. Mani tests his camera case for underwater photography after recording some observations made with snorkel/mask. At this point I’m beginning to notice an intriguing pattern. Both of these officials were native speakers of Tamil with passable English skills. Somewhere in between the levels of Ranger and DFO was a switching point. English use is a demonstration of education and worldliness. Sometimes English is necessary, as when one of the players is not a Tamil speaker. But an Anglophonic conversation between two Tamil Nadu natives of status is like a staring contest, and having to switch over to Tamil language is like blinking. I wonder about the efficacy of this social code. Although I do not understand Tamil at all, it was evident that the conversation between Dr. Mani and the Ranger in Topslip was fluid and comfortable while the other seemed stilted by the socially imposed formality of using what is a second language for both parties. We had the same objective for both meetings—we needed to secure lodging for that evening and no quarters were available (officially) in either place. Both had the same outcome: nothing promised, but if a cancellation were to occur then we would get that space. It’s possible that my presence may have added to the impetus for speaking in English, but I do not believe that it was a major factor. In Dr. Mani’s many phone conversations he spoke either Tamil or English, and I was not party to those exchanges. When I asked him how he decided which language to use, his answer basically confirmed the model that I had been formulating, described above. What is the overall cost of this practice, in terms of effective communication? I suspect that communication is fine at the two ends of the hierarchy: the highest-ranking officials are likely to be very fluent in English, while workers in the lowest levels don’t even bother and just go about their business using their mother tongue. But in the many tiers of middle management where the English of one or both parties is imperfect, there is going to be some breakdown in communication resulting only from the conversants’ pride and unwillingness to switch over to a more comfortable language. Travancoria sp. This flat-bottomed, sucker-mouthed cyprinid holds tight to rocky bottoms in fast-flowing parts of the stream. Corporations in India tend to organize personnel into many-tiered hierarchies, and position within a hierarchy is what defines status. An employee interacts with others as equals, subordinates, or superiors, and the authority of one’s superiors is accepted without question. As an academic Dr. Mani is outside of the forestry hierarchies, and over the course of 25 years of fieldwork he has established connections with high officials in forestry and wildlife as well as many long-tenured employees in the lower ranks—we spend a lot of time meeting and catching up with Dr. Mani’s old acquaintances at all levels. But it is having the friends in high places that has gotten us the favorable results of entry into Patiyar and Topslip after hours. Dr. Mani has played this angle twice already—with some implicit detriment to his credibility. Both delays were unforeseen and unavoidable (vehicle issues), but he tells me that from this point forward we will have no further trump cards to play. 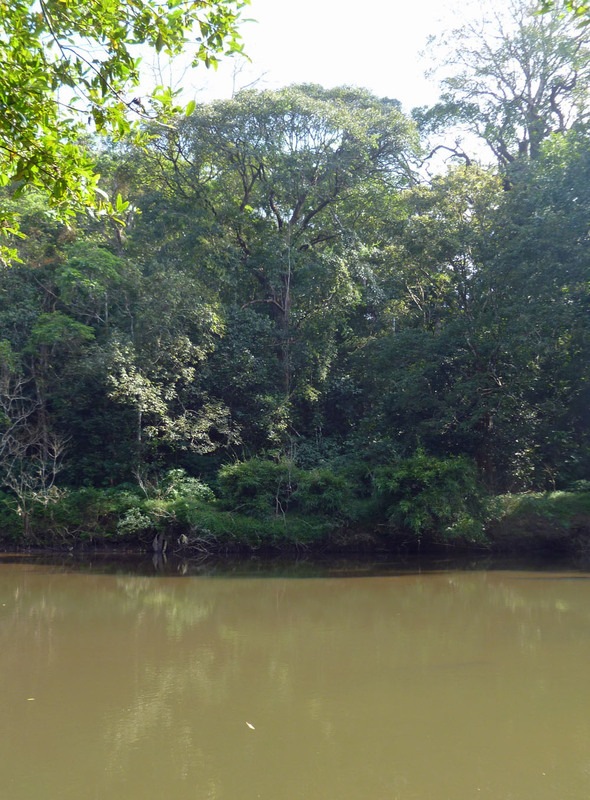 The second site along the Khuriarkurthi River, where I ate my first Puntius carnaticus and saw my first Great Indian Pied Hornbill. It was getting close to noon that we picked up Selevan, a forest guard from the tribal community, to accompany us for the afternoon’s collection. Our route took us deep into the core area of Parambikulam well beyond the parts of the reserve that are available to tourists. 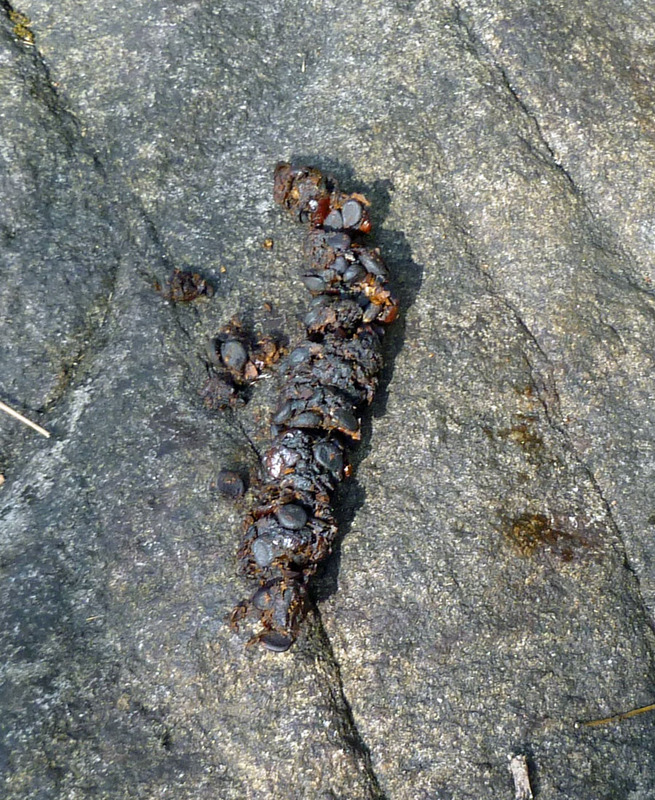 Over a wooden bridge that was signed “unsafe bridge—do not cross” and alongside a stretch of river flowing over a chiseled bedrock of basalt, and further down we pulled up to a tiny tributary for the first of the afternoon’s collections. 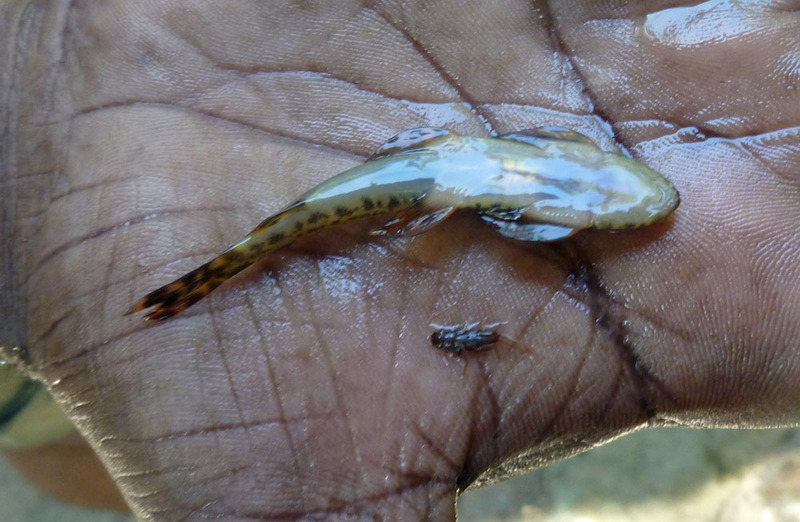 The spot had many of the same general fish forms as before—Garra, Rasbora, Puntius, Barilius, and loaches—but there were a couple of genera that we had not gotten at Siruvani. Danio is the same genus as zebrafish, which is one of the most important model organisms for developmental studies. Travancoria is a fast-water algae eater with a streamlined body and a strong sucker-mouth allowing it to hold tight to boulders in the fast-flowing runs that it prefers. And Tor, which is the fabled mahseer of sport-fishing fame. We only caught a couple of very small mahseer, but their presence indicates that this stream has perennial flow. We collected fish, recorded stream data, and Dr. Mani put on his snorkel and mask to conduct some observations and to test out the waterproof case that I brought him for his very expensive Canon DSLR. The case held its water-tight seal, but some moisture had been introduced inside the case by wet hands resulting in glass fogging and poor photo quality. No photo shoot of collected fishes today though as we were time-constrained. Puntius carnaticus sautéed in coconut oil and coated with fish-fry masala, salt, and wheat flour. The second site was a wide, slow stretch of river and the team deployed a gill net while I tried to “sample” with a telescoping rod and reel that Dr. Mani kept in one of the many bags we hauled around. I didn’t have any luck, but the gill net yielded one fat Puntius carnaticus, which was dispatched, clipped for DNA, and then prepared for my special lunch. Today’s lunch was prepared entirely in the field. Magesh cooked rice in a pressure pot over a gas flame, and he also prepared chicken curry from scratch. Well, almost from scratch. Chicken, vegetables (onions, green beans, carrots, potatoes), and masala. The Puntius was scaled, eviscerated, split, and the skin was scored. A “fish-fry masala” was mixed with salt and rubbed into the flesh, some flour was added, and this was fried in a dosa pan (basically a slightly concave crepe pan). Cyprinids (minnow family fish) aren’t considered food fish in the U.S., but this was really good. Great Indian Pied Hornbill. Photo by Manimekalan. Parambikulam Tiger Reserve. 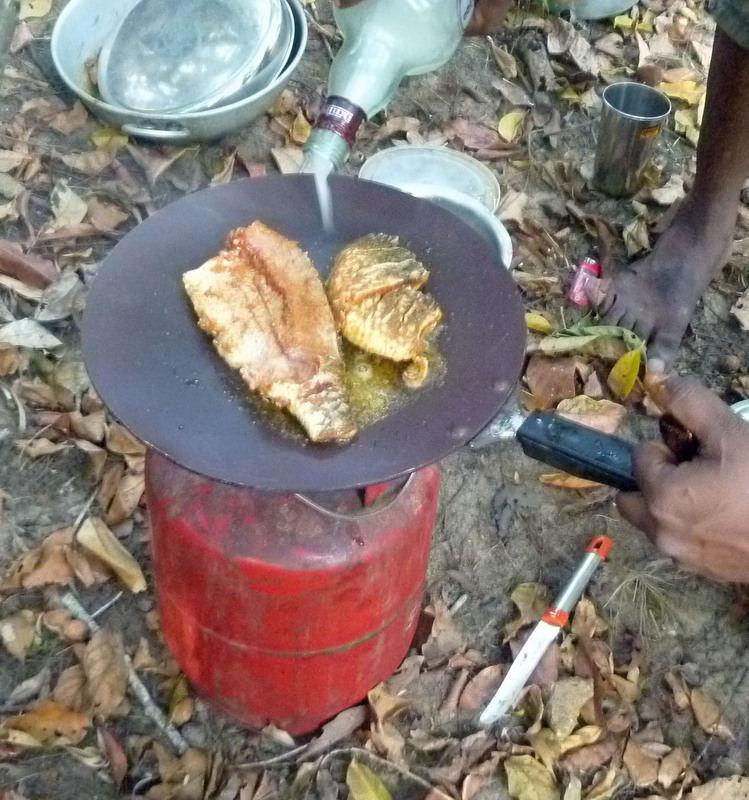 As afternoon stretched into evening, Arun and Magesh processed the fish we collected from the earlier site. 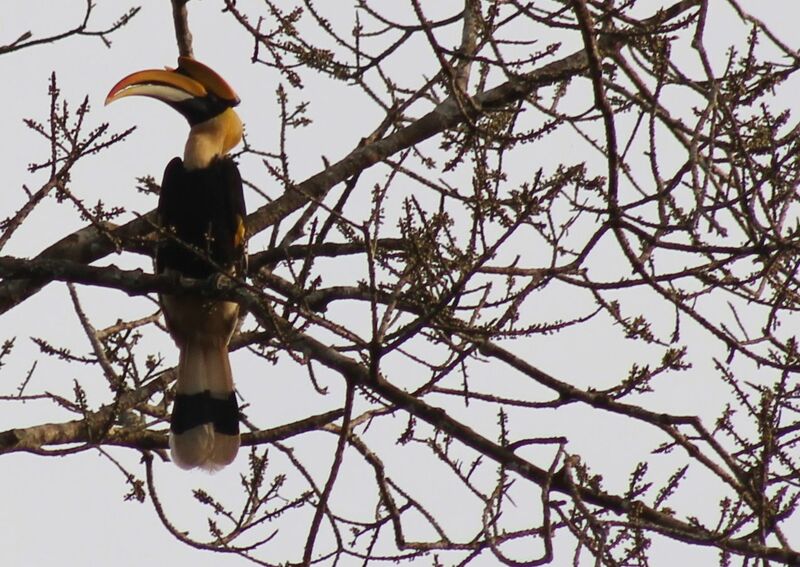 A Great Indian Pied Hornbill alit on a tree across the river from us. Without binoculars, the bird was clearly visible but distant. With the super lenses on the cameras that Dr. Mani and Arun were carrying, however, it was possible to capture some nice detail, even without a tripod for adding stability on the long-distance shot. On the road back to camp, we got views of Spotted Deer, Gaur, Sambar Deer, mongoose, and civet cat. Spotted Deer. Photo by Manimekalan. Parambikulam Tiger Reserve. That evening Dr. Mani pulled out a couple of almost-cold beers from his backpack, and this was better than what we had taken to Siruvani. I ask Arun if I was meeting his expectations, and he confided that he had hoped to be learning from me. Maybe it’s a hierarchy thing—I was a professor, he was a student, so I supposed to profess while he absorbed the pearls of scientific knowledge spilling forth from my parotta-hole. To this point I had been on the receiving end of the learning, although this was mostly because I was reticent to take a lead role in teaching the Indian scholars about Indian natural history. But it was also becoming increasingly evident that both Arun and Magesh were a bit behind the curve in some foundational areas of ecology and evolutionary biology. I could contribute by helping to fill some of those gaps with lessons along the way. The problem with this idea was we were continually traveling under cramped conditions or working on the fish collections, and Dr. Mani kept the scholars busy at other times with cooking, equipment maintenance, loading/unloading of the vehicles. There was no opportunity for me to offer any substantive lessons to the scholars, though I did have abundant time in discussions with Dr. Mani. 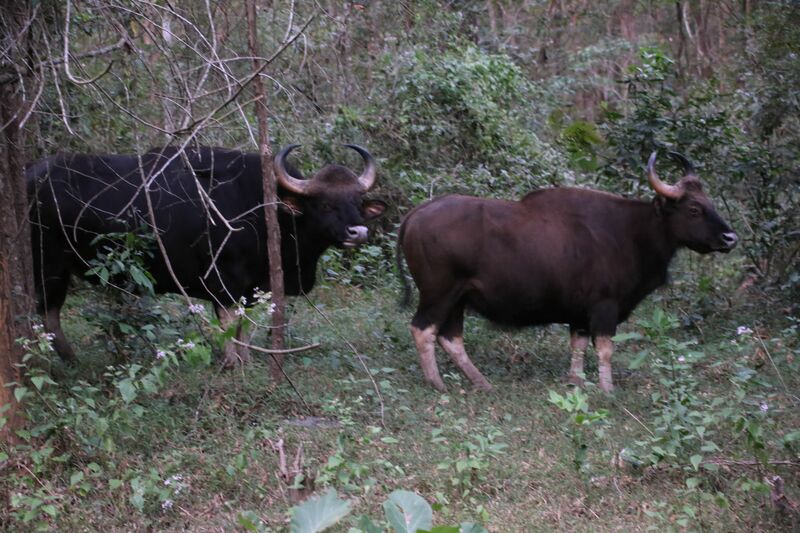 Indian Gaur. Photo by Manimekalan. 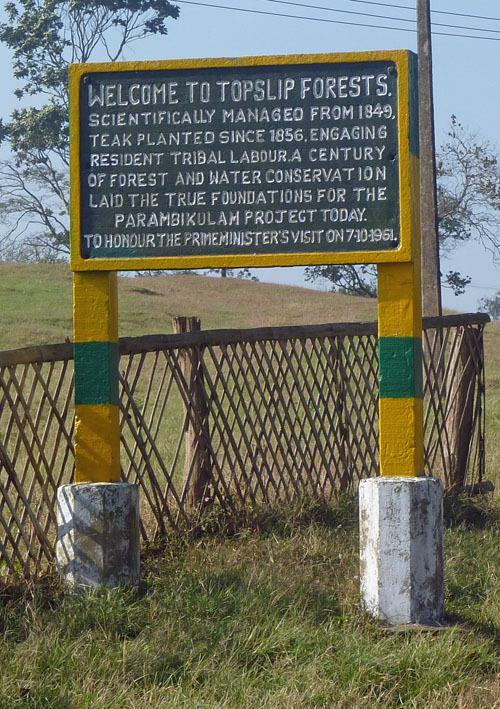 Parambikulam Tiger Reserve. My proposed solution: after Parambikulam I was planning to take a couple of days to travel to Cochin by myself—to see and soak my toes in the Indian Ocean, eat some seafood, and take a backwaters tour. Why not invite the scholars along? They could enjoy a couple of days reprieve from heavy lifting, stay in a nice hotel, and take an opportunity for some more substantial biology lessons along the way.